As one of the primary components of rust, iron hydroxides normally pose corrosive risks to health. 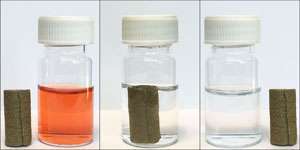 An A*STAR team has found a way to turn these compounds into an environmentally friendly coating that repeatedly absorbs large amounts of pollutants, such as dyes, from drinking water at room temperature. Conventional activated charcoal treatments have trouble removing heavy metals and bulky organic compounds from water. Instead, iron hydroxides are being increasingly used because they can form stable chemical bonds to these unwanted pollutants. Researchers have recently found that turning iron particles into miniscule nanomaterials boosts their active surface areas and enhances chemical absorption processes. Separating iron hydroxide nanomaterials from water, however, remains difficult. Commercial filtration systems and experimental magnetic treatments introduce significant complexity and cost into treatment plants. Failure to remove these substances may lead to acute or chronic health issues if they are ingested. To improve handling of the nanosized iron hydroxides, Sing Yang Chiam from A*STAR's Institute of Materials Research and Engineering and co-workers decided to attach them to a solid, sponge-like support known as nickel foam. This type of material could safely trap and remove contaminants by immersion into dirty water, and then be regenerated with a simple chemical treatment. But immobilizing the nanoparticles also diminishes their valuable high surface areas—a paradox the team had to solve. "We were not totally convinced that a coating approach could perform as well as traditional powders and particles," says Chiam. "So we were really pleased when some nice test results came through." The A*STAR team found their answer by synthesizing iron hydroxide coatings with a hierarchy of structural features, from nano- to micrometer scales. To do so, they turned to electrodeposition, a green synthesis method that deposits aqueous metal ions on to nickel foam at mild voltages. After optimizing the uniformity and adhesion of their multiscale coatings, they tested their material in water contaminated by a 'Congo red' dye pollutant. Within half an hour, the water became almost colorless, with over 90 per cent of the dye attached to the special coating. Close-up views of the coating's nanostructure using scanning electron microscopy revealed that elongated, fin-like protrusions were key to recovering active surface area for high-performance pollutant removal. "Even though these coatings have some of the highest capacities ever reported, they are only operating at a fraction of their theoretical capacity," says Chiam. "We are really excited about tapping their potential."